I'm having trouble generating grids with Google Earth Engine. I've managed to succeed with a province but when I've drawn a shapefile from which I'd like to have grids generated, I don't know what to do next. Any help would be very appreciated. Thank you! If you have a shapefile ( *.shp ) of your own that you want to use to generate the grids then you can upload the shapefile as an Asset to Google Earth Engine. Please follow this guide that explains how to upload a shapefile as an asset. If instead you have a KML file then you need to upload it using a Google Drive Fusion Table ( follow the second part of the guide ). Then you need to specify in the script that you want to use a Feature Collection ( asset/shp or Fusion Table-kml) rather than a country in the first option of the script (LINK TO THE SCRIPT). 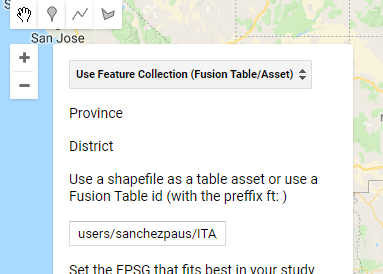 There you choose the first option "Use Feature Collection (Fusion table/Asset)"
Afterwards you can proceed with the rest of the procedure to generate the grid ( important to set teh right EPSG code to get a good distance between plots ). Let me know if this answered the question and if you have any other problems with the tool. This should make creating grids a bit easier!